This tutorial will show you how to tie your Facebook account to your Boxee Box by D-Link so that you can watch all of your friends videos (wall post videos etc) on your TV. To get started, head over to the Services section of the Boxee site. Select the Facebook entry from the left navigation box. Then click the Connect button. 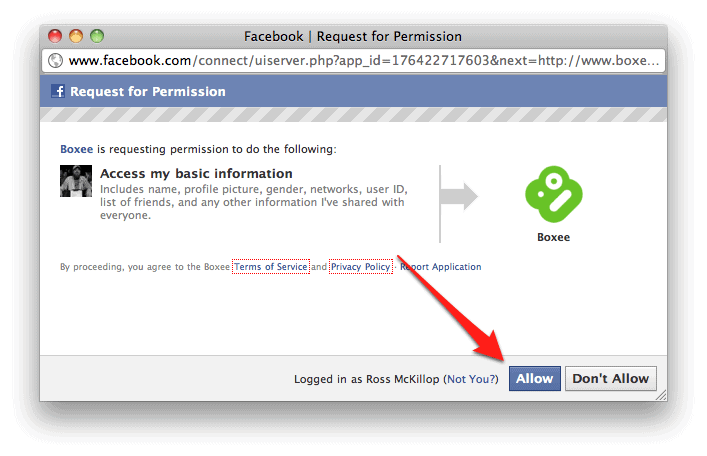 Note: some browsers will ‘block’ the Facebook “pop-up” window – make sure that you allow pop-ups from boxee.tv. The Facebook Request for Permission window will appear. Click the Allow button. By default, Boxee will have placed a check in the box labeled Import videos my friends share on Facebook to my Boxee. If you’d like the videos you share to appear on your Facebook wall, place a check in the box labeled Publish videos I share on Boxee to my Facebook wall. You should also now notice a Facebook icon in your Boxee profile picture. Head over to your Boxee Box. Select Friends from the main dashboard. Note: it may take up to 30 minutes for the videos to start appearing in your Friends list. You’ll see a list of all the videos your Facebook friends have recently posted to their respective walls. Use the remote to select one. You’ll be prompted to confirm that you do in fact want to watch this video. Click the on-screen Play button with your remote. Depending on the speed of your Internet connection, it may take a moment to buffer the video. If a browser window briefly pops up, have no fear. Now the video you selected will start playing in full-screen. That’s it – your Facebook account is now connected to your Boxee Box – you’re done! I’ve restarted quite often the boxee-box (sometimes for blocking reason, sometimes to save the planet and don’t waste energy) but that wasn’t the problem. I don’t know if it’s the solution but yesterday, I went into my services and disabled facebook an re-enabled it. Yesterday evening I was still stuck with my out-of-date videos (7days without update) but I can see in my boxee.tv’s profile page that now it’s up-to-date.